(Bloomberg) -- Sears Holdings Corp. is considering whether to auction off a chunk of debt that could give the bankrupt estate an infusion of cash while potentially allowing a bigger payout to hedge funds that bought insurance against its default. Sears may sell as much as $900 million of notes that are essentially intercompany loans from one subsidiary to another, according to people with knowledge of the matter, who asked not to be identified because the discussions are private. Normally, the retailer might find few takers for such unsecured debt. 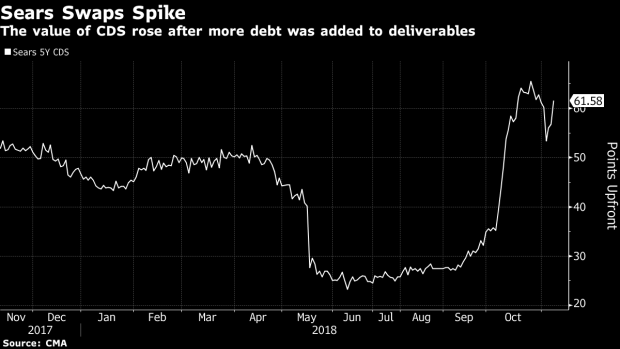 But to hedge funds and other investors that bought roughly $400 million of side wagers known as credit-default swaps, the notes could significantly boost the amount they are owed on those trades. The potential sale is the latest example of how the $10 trillion market for credit derivatives can influence the fate of the companies they are tied to. In the last year, traders seeking to profit from bets on derivatives have extended financing to companies including food distributor United Natural Foods Inc., homebuilder Hovnanian Enterprises Inc. and newspaper publisher McClatchy Co., Bloomberg News has reported. Sears has been trying to line up fresh cash as it seeks to keep its doors open and reorganize in bankruptcy. When it filed for Chapter 11 protection last month, the retailer said only lined up part of the funding it needed to stay in business. For the hedge funds, the note auction would mean a potential windfall on their CDS trades. In recent months, they have faced the prospects of getting paid only a small amount on the derivatives because they are linked to a part of Sears that now has little debt outstanding. With a scarcity of bonds issued by that unit, there’s more CDS wagers to settle than available debt. That is, unless Sears decides to sell the intercompany notes, which were recently added to a preliminary list of obligations that can be used to settle CDS contracts. A sale would unleash a wave of cheaply priced debt that could drive up the payout for CDS buyers. The Sears estate may seek the bankruptcy court’s approval to sell the intercompany notes to dealers as soon as Tuesday, the people said. Brigade Capital Management, Omega Advisors and Och-Ziff Capital Management Group are among fund managers that bought CDS against a Sears default and are awaiting a payout, the people said. A spokesman for Och-Ziff declined to comment, while representatives for Brigade and Omega didn’t immediately respond to a request for comment. A representative for Sears declined to comment. The CDS holders would be able to deliver the intercompany debt into a separate auction next week that will be determine the payout rate on the derivatives. A committee of CDS market participants must still make a final determination on whether the notes are deliverable into the auction, which is scheduled for Nov. 14. The CDS trades are giving Sears a willing buyer of notes that might otherwise struggle to attract interest. While the securities would sell at a huge markdown, they may still fetch 20 or 25 cents on the dollar, handing the estate tens of millions of dollars, one of the people with knowledge of the discussions said. A sale of the notes could set up a bidding war between the hedge funds, banks or other investors who bought insurance and others who sold the CDS protection. Sears has been trying to line up at least $300 million of additional bankruptcy financing to stay open through the crucial holiday shopping season. The retailer was inching closer to a loan last week, a person with knowledge of the matter said, while declining to name the prospective lender. Sears Chairman Eddie Lampert, the company’s biggest shareholder, had been in talks to provide at least some of the financing, but wasn’t involved in the latest negotiations, the person said. Sears previously has said it was in discussions with hedge fund Cyrus Capital Partners to help fund the lifeline. --With assistance from Dan Wilchins.